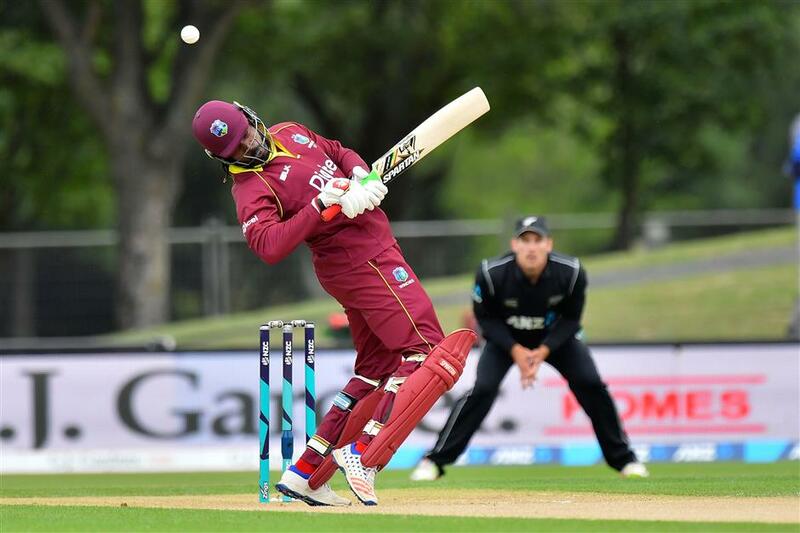 West Indies batsman Chris Gayle is hit by a ball during the third one-day international against New Zealand at Hagley Oval in Christchurch on December 26, 2017. The West Indies were again left searching for ways to handle New Zealand's bowlers after crumbling to a 66-run defeat in the third one-day international in Christchurch on Tuesday. The comprehensive win in a rain-abbreviated match extended New Zealand's unbeaten run over the tourists, giving it a 3-0 sweep of the ODIs after winning both tests inside four days earlier this month. In the third ODI at Hagley Oval, the West Indies were set a revised target of 166 in 23 overs after a lengthy rain break restricted New Zealand to 131 for four in 23 overs. A valiant 34 by Holder helped the visitors reach 99-9 by the end of the innings, with Boult producing figures of three for 18 and spinner Mitchell Santner 3-15. A dejected Holder also saw critical problems in his bowling line-up after New Zealand was restricted to 83-3 in 19 overs when the rain set in and then cracked 48 in four overs after the resumption.